Every week, the Masked Man, Deadspin's pro wrestling correspondent, honors the sport's fallen and examines their legacies — famous and obscure alike. Today: "The Big Boss Man" Ray Traylor, who died of a heart attack in 2004. He was 42. Ray Traylor started his wrestling career in the most unremarkable of ways: as a jobber — enhancement talent, in gentler parlance. He was one of the Average Joes sent out to get clobbered by the stars. For the majority of jobbers, this was the end of the story — they wrestled some matches, they lost some matches, they went back to their day jobs with a story to tell. It isn't exactly college football glory, but it's something. Ray Traylor wasn't destined for greatness any more than a thousand other guys. And yet, there was something about him. Dusty Rhodes (who knows a thing or two about the Common Man and the American Dream) was the head booker at the time in NWA, and he saw that something. After watching Traylor lose a few squash matches, Dusty pulled him off television and made him over as a bullying enforcer called Big Bubba Rogers. Big Bubba would soon be feuding with Dusty himself — then the promotion's top babyface — and Traylor's rise from nothing to something was confirmed. The monstrous Big Bubba Rogers, who stalked to the ring in a suit and tie, was a villain, but he was living the American Dream. After a run in the UWF where he faced off against his future tag team partner, the One Man Gang, Traylor was hired by the WWF and repackaged as the Big Boss Man, a wrestling prison guard. Or unpackaged, rather. Because even as the idea of the wrestling law officer fed neatly into the play of good and evil at the heart of pro wrestling, it was also a reference to real life, as Traylor himself had been a corrections officer in Cobb County, Ga., prior to falling into the wrestling trade. "Stone Cold" Steve Austin was fond of saying that the best characters in pro wrestling are the wrestlers who just play themselves, but with the volume turned up. 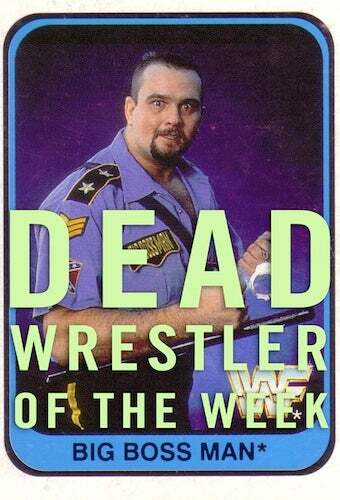 The Big Boss Man followed this model — he was little more than the WWF-trademarked version of Ray Traylor. But perhaps this was a foregone conclusion — Traylor didn't have it in him to play a monster like Abdullah the Butcher or even the Earthquake. He was too average, too unaffected. (And by all accounts, a total sweetheart backstage.) Ray Traylor was destined, it seems, to be Ray Traylor. He was a god-fearing, tax-paying citizen of the world — he was unremarkable, and that was his indelible appeal. The Big Boss Man began his WWF career in a wholly pedestrian way, too: he beat Koko B. Ware in this first pay-per-view match at SummerSlam 1988. But the WWF writers soon saw the same spark in Traylor that Dusty had seen before, and in short order the Boss Man was feuding with the anything-but-regular Hulk Hogan. It turned out to be a sort of back-burner grudge for Hogan: he fought Boss Man at house shows and on free TV, but he spent much of his time in those days dealing with his dissolving friendship with "Macho Man" Randy Savage. The Boss Man bided his time teaming up with fellow bigman Akeem the African Dream (formerly the One Man Gang), under the "tutelage" of the huckster manager Slick, against top good-guy duos like The Rockers and Demolition. But his simmering dispute with Hogan culminated in a near-legendary cage match on Saturday Night's Main Event, wherein Hogan superplexed Boss Man — all 350 pounds of him — off the cage and into the ring. It might not have been incredible as it seemed at the time, especially viewed today through hardened eyes of a wrestling fan who lived through ECW and Mick Foley's Flying Wallendas routine of the late '90s, but for the time it was good enough to be incredible. Which is a pretty good epitaph for the Big Boss Man, come to think of it. Ray Traylor was an average guy who achieved his place in the pantheon for being just that, if a little better. This was crucial to Traylor's appeal. When the average wrestling fan looks at his reflection and appraises himself honestly, he probably doesn't see Hulk Hogan staring back at him. But consider the Big Boss Man: he's overweight, he's got a crewcut and goatee, he's Southern, he's blue-collar. This is the everyman, to a large portion of the WWF audience. "Justice will be served," he would say, and wrestling fans heard within it a deeper truth — that was precisely what they wanted from wrestling, and what they wanted from the universe. In his pants and (tucked-in) shirt, the Big Boss Man was Willy Loman in the funhouse mirror of pro wrestling: big and burly, sure, but a man of principle at his core — and yet an underachiever, a man not wired for greatness. He was the archetypal mid-carder, almost unremarkable, but somehow — and this can only be to Traylor's credit — entirely unforgettable. When the Big Boss Man became a good guy, it was (of course) in the most commonplace sort of way — Bad Guy rediscovers his good streak and falls out with other baddies. But in this case it was portrayed perfectly. In a matter of mere moments, the Boss Man goes from the most diabolical of men to a fan favorite without betraying his character — and we cheered loudly, because we understood him, because he was one of us. Little wonder that in an era in which half of the wrestling superstars on WWF TV were assigned unglamorous middle-class careers "outside" the wrestling world — the garbage man, the pig farmer, the IRS agent, the repo man — the Big Boss Man was the only prole to achieve any lasting fame. He worked not because he acted like one of us, but because he was one of us. The Boss Man would soon feud with his old partner Akeem, and then with a heelish lawman from north of the border called the Mountie (played by the underrated Jacques Rougeau). This latter feud was notable because it featured the Mountie attacking the Boss Man with a cattle prod (complete with overdubbed electric shocking noises) and culminated in a match in which the loser had to "spend the night" in the county jail. When Traylor left the WWF for WCW in 1993, he abandoned law and order for vigilante justice and became known as the Guardian Angel, complete with red beret, but he soon reverted to his old Big Bubba Rogers persona, and then again to his real name. (This was mid-'90s WCW after all.) In his return to the WWF (and to the Boss Man character) the storylines only got stranger. Despite the privilege of feuding with Steve Austin, Degeneration X, and the Undertaker, that last conflict ended in a "Hell in the Cell" match that saw the Boss Man hanged by a noose in the center of the ring. (The announcer did his best to undercut any notion of implied reality by screaming, "Is it symbolic?!?" over and over, even as Traylor played dead.) A grudge against Al Snow, another Regular Joe, hinged on the Boss Man killing Snow's pet Chihuahua and serving it to an unaware Snow for dinner. The Boss Man then battled the Big Show for the WWF championship in a storyline in which the Boss Man crashed the funeral of the Big Show's father and made off with the coffin chained to the back of his car. There wasn't anywhere to go from there. The Boss Man's WWF tenure ended not long thereafter. His last match was against wrestling's other preeminent everyman, ECW legend Tommy Dreamer. One more story about Ray Traylor: WrestleCrap legend has it that there was a segment on America's Most Wanted in which the criminal in the filmed reenactment of a heist bore an uncanny resemblance to Ray Traylor. The story goes that wrestling fans nationwide called into the hotline with the same tip: you can find your perp at the WWF show on Monday night. That Ray Traylor could so convincingly be mistaken for someone else speaks loudly to his everyman credentials. And in the end, that the chubby guy with the goatee made it as far as he did speaks volumes about Ray Traylor's talent. So we bid you farewell, Big Boss Man. You weren't the best ever, but neither were we. The Masked Man works in publishing.